Austin Wright for Mayor 2010 - I'm Ready! The Newspaper today did not appear to describe the same forum I attended last night. They gave Randy Hope 9 cherry-picked paragraphs of rhetoric dedicated to his responses, making it appear nobody else answered the question. The same article gave my responses only 3 lines, likely buried somewhere on the inside pages. Several people commented to me afterward that I was the only candidate giving answers, which I also heard in Tilbury, Ridgetown and Chatham. Once again, the media seems to have picked its horse, and has also begun using “hope” in headlines a statistically improbable number of times, despite the editor’s promise of “fair” coverage. Interesting article. It gives the most ink to Randy Hope, including a low blow parting shot from Hope to myself. (Where was my closing speech?) What Randy Hope did not say is that more parts of my “losing” platform have been validated and implemented on his watch than his own and thank goodness we had them or almost nothing would have been done. Hope doesn’t say that after being mayor 4 years, he has never brought a single successful motion, does not have any platform, and he’s been reading from his 2006 campaign flyer basically admitting it never got done. The article does not mention my 33-page Plan for Prosperity at all, which I featured prominently in my answers. It’s the most comprehensive job attraction platform ever presented in a Chatham-Kent election, but a candidate putting in all that extra effort is not news I guess. This document is packed with answers, and is way more than the comments stating the obvious “we need more jobs” that everyone else offered. I named specific initiatives that Chatham-Kent now has plans to pursue after I introduced them during this campaign, such as using MaRS to match start-up capital to innovative entrepreneurs, attending strategic trade shows in emerging new sectors, and assisting our youth to return to Chatham-Kent to start businesses. I am already at work trying to attract jobs! I also explained to the forum how we could target attraction efforts to businesses from Toronto that do not depend on their geographic location. From the article you’d think Hope was the only one to answer. “While most of the candidates proposed lobbying for the expansion of Chatham-Kent’s post-secondary institutions Hope said…” That is not true at all. I said that if elected I would immediately form a panel of educational experts to explore ways to attract and expand post-secondary education programs in Chatham-Kent, including academic and medical curriculum. Why did they single out the mayor’s answer and make it look as if I were one of the crowd? I’m the only one who offered a plan for education backed with an implementation promise. Reading the media coverage of this election has made me wonder if they are writing about the same events I attended. In some cases they are taking “fair and balanced” to such extremes that you don’t get any flavour at all, but in my opinion this one clearly favours the incumbent. This just shows the need to do your own research, check all our campaign websites, filter rhetoric, and make an informed decision. Please remember to vote. In opening remarks, I took a friendly swipe at Tom McGregor, reminding people that I’ve been very involved in the Wallaceburg community with my family over the years, in case Tom thought he had hometown advantage. We started by answering printed questions that not everyone had. I offered Al Traylor mine, and told him not to copy the answers I had written down. Tom McGregor did the same for Ian McLarty, who promised not to peek. It was a light moment with laughter from the crowd and candidates. The next question asked for our vision of the Economic Development department. I stated that our communities became successful due to hard work and promotion by our own people, not high-salaried staff who shun public assistance and want to do everything themselves. 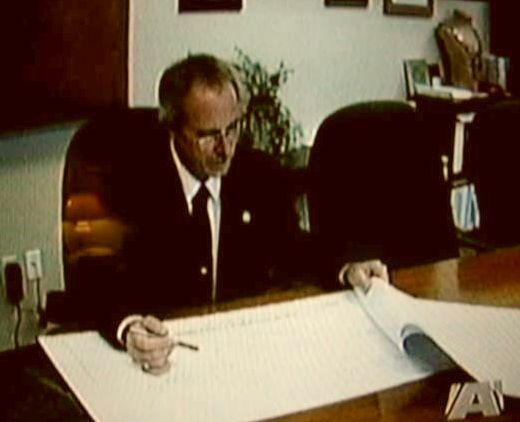 My 2003 platform proposed business attraction and retention committees in every community based on the Wallaceburg.ca model, which was in fact subsequently implemented successfully as the Wallaceburg Community Task Force. I wanted those in every community with proper support. We answered a question about rail access to Wallaceburg. I know that rail is needed for the industrial park, and to attract new business or else Wallaceburg is in trouble. I favoured retaining the C&O Railway but needed to see a good viable business plan first. Ian McLarty said it was not even on his radar and had no intention of making it a priority. On high unemployment, I countered Ian McLarty by reminding people that I could multitask and delegate so that I could handle more than one priority at a time. Tom McGregor had stated some jobs have “negative” impacts for the community. I suggested that none of the 8,000 people looking for a job would view one as negative. I proceeded to outline my plan, and indicated some is being implemented already after I brought it up. I noticed that Randy Hope’s answer was awfully similar to my 2003 mayoral platform. The media did not report that Hope’s entire solution to youth attraction was to put kids back on the farms. My answer stated that I was one of the youth who left Chatham, so have some insight. I returned to start a business, so we need to be more welcoming and supportive to young entrepreneurs. I also mentioned plans to set up a post-secondary education panel. When asked about high taxes, I indicated 3 ways in 60 seconds where we could cut expenses significantly. The media latched on to my call for Sunshine Club salaries to be frozen, but missed the savings I proposed by replacing consultants with citizens’ committees and brainstorming sessions. They ignored my comments calling for government to migrate to free Open Source Software which has saved $60 billion industry-wide. Vancouver is already doing this. Randy Hope answered that we need more taxpayers, and proceeded to repeat my “Four-Point Plan” from my previous election campaign that the mayor slammed in his closing remarks. My Four-Point Plan has evolved into my Plan For Prosperity, which explains how to get more taxpayers. The article headline mentions the Con-Ex Centre, but only quotes two candidates. I said the question was loaded, (since it was obviously submitted by a McLarty supporter who claimed it was direct competition to existing businesses including the Oak’s Inn). I responded that I do not favour municipal initiatives that compete with the private sector, but that the Con-Ex is designed to attract those events that can’t come to Chatham-Kent now because there’s no appropriate venue. I reminded people that the question arose because we were forgetting to think big enough. Hope later used this line in his answer. On municipal wage increases, I suggested a Sunshine Club wage freeze until we have satisfactory performance because that club does not let its members leave easily. The media truncated my response for sensationalism. Mary Lee held up a copy of the Sunshine Club list that only discloses salaries of those making over $100,000, and told the crowd that, “Not one single municipal employee is making under $100,000! This is the list of all municipal employees, and they all get more than $100,000.” That wasn’t correct at all. Rex Crawford asked a question about municipal debt. Some candidates pointed out that many misleading debt figures were being circulated, and two candidates were quoting those false debt figures. I explained how the debt was comprised, and what it got us. I mistakenly said only $37 million of the debt was financed by taxpayers. In fact, it’s actually $32 million, all according to the official Audited Financial Statements. I promised to be a good guardian of that debt and never be complacent even though most of it was prudent and necessary. Randy Hope responded that it created Return On Investment, a term I taught him during earlier debates. Bill Arends asked about community meetings. I explained how to do it to break down barriers and open lines of communication. My plan involved brainstorming sessions and community committees to give control back to our people and communities, and keep them engaged and valued. Hope admitted this hasn’t been done and said we need to derive more input from the community (which validates my plan). Tom McGregor said these meeting were not necessary as he preferred to meet with people informally at their workplaces and sporting events. Not being a “debate” I didn’t get a chance to counter that politicians need to be more accessible, and you won’t get much brainstorming from the places Mr. McGregor proposed. On the topic of OPP costing, I said that I studied the Sarnia proposal intently, and favour a costing for Chatham-Kent because it would serve as a valuable benchmark. My belief is that our own Police Services will sharpen their pencils, and it’s only fair to taxpayers to make sure we’re getting value for our money. Randy Hope and I agree 100% on this issue apparently. He also mentioned the need for an apples-to-apples comparison and to factor in the value of retaining local control. It’s just a costing and nothing more. Tom McGregor does not agree with having a costing done, and cited some of the same reasons we did to justify one. There is no margin of error in choosing your next mayor. Leadership takes the resourceful spirit, and teamwork that has defined us since the first pioneers and immigrants arrived. I am not running for mayor to be a celebrity and have fun. I’m a father who wants all our children to have options for a bright future right here in Chatham-Kent. I’m the husband of a breast cancer survivor, and a businessman who knows the challenges being felt by too many people in our community. I offer voters 23 years of management experience and entrepreneurial vision to achieve big results with limited resources, so that taxpayers save money without losing services. I’m a strong advocate for the families, farmers, seniors, and everyone living paycheque to paycheque who cannot afford the escalating taxes. This Plan for Prosperity (which I held up) sets me apart from all the other candidates, who have only just begun to notice we have a problem and think somebody should do something. That somebody is me, and I am pleased to present the voters with ideas of substance that propose solutions instead of the usual campaign rhetoric. I am not deterred by the challenge ahead, and I’m dedicated to the hard work necessary to accomplish results for our communities. We have everything we need to be successful, except the right mayor with a defined direction. Together with your support, we can change our future for the better. My platform is online, at www.ckon.ca. I would invite you to look at it and judge my preparedness. On October 25th, I ask you to vote Austin Wright for mayor. I am ready! Randy Hope attacked me by stating I lost in 2003 by over 10,000 votes, then started raising his voice louder and louder. He claims he got elected last time to be mayor for 12 years, and mentioned that he would bring prosperity for everyone. He didn’t state that his platform this time was only eight lines long, and did not explain why it was my “losing” platform that was implemented. My record as a “defeated” candidate is stronger than the incumbent’s so it’s no wonder Hope feels threatened by my candidacy. Tom McGregor read his same speech about Chatham-Kent being a big place and only he is qualified to run it. Ian McLarty talked tough about “misleading reports to council” with “false information,” saying he’s not just one vote on council. He claims to know business and take the job seriously. His solution was to “order Administration” to “cut all the fat” and make 10% reductions to everything because they can do that “easily.” Our recent Corporate Review states this isn’t true, and this does not demonstrate leadership. It’s passing the buck. Al Traylor held up a chunk of tree branch, and told everyone it was really bad because nobody is talking about the end of the world that is nigh, and that we’re killing the earth. Of course, this take is from my own perspective and memory which may be a bit biased, but none of the corporate media coverage has done these events justice. My answers were every bit as newsworthy as the incumbent mayor’s. I am pleased to release my Plan for Prosperity – a comprehensive platform of ideas and solutions designed to accelerate our economic development results. If I’m elected mayor, I won’t need four years to figure out a direction. I am ready to hit the ground running now. It is posted as a text web page or you can download the entire book as a PDF file. The entire document is 33 pages long. I don’t expect everyone to read it through. All I ask is that you consider giving your vote to a candidate who cared enough about the community to run for mayor in difficult times and present a book of answers. Put your trust in me with your vote, and I will work hard as a team leader to refine and implement these ideas and help us achieve good things. I’ve spent the past few years listening to people’s concerns, and coming up with solutions. Many of my ideas found their way into policy already, which defines me as a credible, sensible candidate. Sadly, too much remains still to be done, and several plans were implemented poorly. This requires my own oversight as mayor to remedy. Other candidates say they started listening and will take action, but how? They barely even noticed that we have a crisis. They plan to order administration to come back with the answers instead of providing the leadership required to be mayor, which results in the rubber-stamp council people say they don’t want. Mayor Hope did not bring one single motion in 4 years to keep his campaign promises, nor are we certain of his own enigmatic vision which he seems unable to articulate when asked. Nobody on council with mayoral ambitions stepped up to fill the leadership void. The urgency to take action on critical issues has never been greater. This campaign is all about you, and giving control back to the people. I’m prepared to bring answers to the table, and make sure administration implements the will of council. If elected, I will put my energetic entrepreneurial spirit to work solving problems immediately, as a full-time mayor. My direction and vision are defined and in place from day one. I am ready! Council is the ultimate authority in the municipality. As head of council, I will exercise my obligation under the Municipal Act to represent the public, enhance the best interests of the municipality, develop and set policy, ensure administration carries out the will of council, and to maintain financial integrity. I will be accountable to the public, and will hold administration to the same high standard. To improve ethics, I propose appointing an Integrity Commissioner, Auditor General, Lobbyist Registrar, and Municipal Ombudsman, as permitted by the Municipal Act. These will be volunteer appointments vetted by council. Each position has special powers, and can go places council cannot, including compelling testimony under oath. Freedom of Information needs a complete overhaul to remove the power Randy Hope gave himself as Head of MFIPPA. Currently, the mayor sees all FOI requests and all replies, and determines what is released. He’s used this power to give private and confidential information to others for inappropriate purposes, and also to hide and obstruct municipal information that should have transparent public access. FOI applicants are not advised the mayor will see everything, and is in full charge of who gets what. Randy Hope promised transparency and did the opposite. My Plan for Prosperity highlights many ways we can achieve some accelerated results instead of just coming in second. These are concrete ideas which can be implemented, not simply vague observations of the problems. The plan includes ways to identify and target emerging new sectors. Some of my ideas and policy directions have already been embraced by Economic Development. Details of this Plan for Prosperity have been mentioned elsewhere as the underlying theme of my campaign, and the document will be released online shortly. I hear you loud and clear. Controlling spending and taxes are an absolute priority. The time for studies and makeshift measures (such as dipping into reserves to limit the election-year tax increase) is over. This is how I’m going to do it. We have spent money for 12 years building infrastructure that’s first rate. We are not lacking in recreational facilities, roads, bridges, PUC services and the like. We built it, but they didn’t come. Now, it’s time to step back and evaluate our direction. I am committed to seeing approved projects through to completion. That said, I’m tired of hearing from administration that we’ll attract jobs and industry and immigrants if only we had a new ________. Well, we’ve got it. It’s time to concentrate on capitalizing more on what we have, and fixing the one red flag that chases away investors – high taxes. This isn’t a line in the sand against new spending, because our direction must always be forward. I will insist that proposed new spending be analyzed for a Return on Investment. That means taxpayers must have some intrinsic benefit over the short or long term – value for money spent. Next, expenses must be brought under control. My plan will review departmental needs, and identify duplication, inefficiencies, and potential synergies. In my opinion, Sunshine Club wages need to be controlled because that club doesn’t let members leave easily. In the midst of the worst recession, they earned 7.3% more from 2008 to 2009, including “step” increases – symbolic of the disconnect with our people. Some consultants play critical roles in government function. The planners provide independent overview on a cost-recovery basis. However, millions do go to consultants to perform tasks that should be left to the people. I propose that the way to reduce these costs is to make better use of resources in the community, with citizen’s committees, think-tanks, and brainstorming sessions. Finally, our priority must be increasing the tax base so that more taxpayers pay less. Business taxes are disproportionately high, and need to be realigned as tax base expands. My economic development plans address this. Having an Auditor General will ensure maximum transparency and identify to investors that Chatham-Kent is well-run. The Municipal Act permits a municipality to appoint an Auditor General who reports to council and is responsible for assisting the council in holding itself and its administrators accountable for the quality of stewardship over public funds and for achievement of value for money in municipal operations. The Auditor General is entitled to have free access to all books, accounts, financial records, electronic data processing records, reports, files and all other papers, things or property belonging to or used by the municipality, the local board, the municipally-controlled corporation or the grant recipient, as the case may be, that the Auditor General believes to be necessary to perform his or her duties under this Part. This is not a function that council can perform, contrary to what some candidates stated. I propose the position be a volunteer appointment fully vetted by council. Some candidates are capitalizing on public outrage by promoting misleading figures for political advantage. This means that our municipality has not done a good enough job communicating the facts to the public. I do my research, and read the reports. My promise is to provide accurate facts, and perform due diligence to ensure administration reports are also fair and factual. The layers of secrecy at city hall must be peeled back, with better access to information. Correction – on October 7th during a televised debate, I inadvertently claimed our new municipal logo cost $200,000, when in fact we spent $28,350 with a Nova Scotia consultant. The tender included extensive public consultation of the type I promote. It was the cost of implementing the new logo that drove up expenses, such as $60,600 for new signs and fleet decals at an unnecessary and arbitrary time. There is much valuable information on the Chatham-Kent portal. However, the interface is unfriendly – even I have trouble finding things I need. There are no photo galleries of our communities, pictures of our residents, business and personal testimonials, or multimedia. This website is the FIRST IMPRESSION many people get of Chatham-Kent. It is critical that it be user-friendly and interesting. Today’s reality is that we are more likely to attract a new business, industry, tourism or doctor through a Google search than any other means. I will use my considerable expertise in photography, web design and software programming to ensure our website is providing vital information in a friendly and effective way. The council agendas used to be available online as a single document, easily saved and sorted. Now, they put every agenda item in a separate file, with the same file names used over and over every week, which actually makes them less accessible and harder to catalog. I was told this was done to prevent somebody from “accidentally” printing off all the pages at once, but to me, it makes it easier to hide things. I’ll put the council agenda back online in a more user-friendly style. I want the option of having all the pages in a single document filed by date. Streaming council meetings online for those not served by Cogeco was also my idea from previous campaigns that I pushed to have implemented. Mayor Hope was actually elected but didn’t accomplish any of his campaign promises. I guess they liked mine better. Most of my thoughts and observations on community governance were validated by the Corporate Review and Community Governance Task Force. Certain parts of amalgamation weren’t done well. I intend to open up lines of communication with rural communities. I’m concerned about escalating user fees and insurance premiums disincentives. There should be local business attraction efforts, and success should be rewarded by area-rated tax credits. To achieve this, I first proposed forming a network of community councils, nominated and elected at townhall meetings, to serve as volunteers. They would meet to address local matters, and have certain authority designated by council, so that some decisions are made back at the local level. A delegate would liaise with the ward councillors and mayor, with a defined communication strategy. As mayor, I’ll spearhead this initiative. It can be tried on a provisional basis, and if it works as well as I predict, it can be a permanent part of municipal restructuring on passage of a proper referendum. 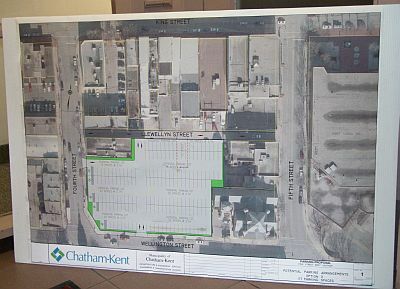 Chatham-Kent has incurred some debt to complete important capital projects. This debt, at today’s low interest rates, enabled infrastructure to be maintained and improved in a prudent, forward-thinking manner. Standard & Poor’s has rated this debt low-risk with a positive outlook, and we have a better credit rating than Essex County. While not alarming in the proper context, I will not become complacent about our levels of debt, since maintaining our good credit standing saves tax dollars in interest. There had better be a very good reason to take on further debt! Some candidates are once again distributing false debt figures. Their figures look good and provocative on glossy paper, but it isn’t factual. I question the source, and challenge them to disclose the accounting principles they are using to inflate the debt figures and unduly panic voters. They also forget that not all the debt is funded by taxpayers. The PUC pays debt through rates, not taxes, and our water rates are some of the lowest in Ontario. The loan for Riverview Gardens is paid by the province. Being the husband of a breast cancer survivor, this issue is very close to home. I have seen the system work to save lives. I’ve also seen how easy it is to fall between the cracks like too many people here. My wife has no follow-up because of the doctor shortage. The system that saved her life is now failing. I am strongly motivated to address this crisis. Doctor recruitment efforts must continue, stressing the amenities we already have in place. Council must continuously lobby for recognition of foreign doctor credentials, and identify new physician attraction methods. An independent Medical Officer of Health is a top priority – still – just as it was in my 2003 campaign. I want greater emphasis on wellness programs designed to keep people healthy promoting active lifestyles, trails, recreational facilities, outdoors activities, and nutrition. Let’s do this financially smarter than current methods. I saw a Participaction ad recently that said absolutely nothing (federal tax money hard at work), and $20 million in paved bike trails is not effective use of tax dollars. There has been too much silence on the lack of family doctors, and I’m putting it back on the agenda. I have personally faced struggles that include delay and denial of medical care, and that’s not acceptable for anybody. Tourism is part of my Plan for Prosperity. I have ideas for more effective and unique promotional methods. Passport programs will be developed for day-trippers, to get people out into our rural communities on bike, foot, and car – maybe even horseback and skidoo. We’ll work with other jurisdictions to implement a Lake Erie Circle Tour, and base new initiatives on our rich local history, such as “Reality” experiences of the Underground Railroad or the War of 1812, which is a huge opportunity. I’ll call Discovery Channel and invite them down here to film some re-enactments in advance of the War of 1812 bicentennial. The importance of hosting weddings and family reunions in Chatham-Kent must not be overlooked. Chatham-Kent is an ideal place to create a thriving film and television industry. With the move to HDTV, a great opportunity exists to fill the need for new programming. As an amateur filmmaker myself, I will work hard to introduce concepts which will designate us as a “Hollywood North.” The Chatham-Kent website currently mentions nothing about this important emerging sector, while other municipalities have policies and movie coordinators to assist producers. With “Reality TV” being popular, Chatham-Kent’s rich history provides ample opportunities for local productions. I am extremely committed to forming environmental policy, from tree planting programs to alternative energy. I’ll work to improve the Strategic Plan’s environmental priority. I propose turning the Industrial Park into a modern model of environmental responsibility, through exploration of co-generation compatibilities, attraction of alternative energy equipment manufacturers, and green-minded landscaping (on paper concepts, not with tax dollars). Stewardship opportunities will be promoted. I don’t favour laws that take away property rights, but I think we can achieve good results with voluntary programs. There are some good examples of land, wetland, and forest stewardship across Chatham-Kent without costly master plans and tough by-laws. Recycling programs must be expanded to divert additional types of waste. There should be recycling facilities in schools and parks. Apartments and institutions must not be exempt from recycling. For 7 years, I haven’t heard the word “compost” outside of my election campaigns. We should renew our composting initiative, including a central facility for yard waste. Christmas trees, pumpkins, yard waste, or any recycleable material does not belong in the landfill. I’d like to explore options to temporarily exceed bag limits, for a fee, which is used to offset costs and improve the recycling program. I will not be pursuing any plans to bring Toronto garbage to Chatham-Kent to prematurely fill our landfill. One big problem with recycling was that the trucks left a trail of broken glass everywhere due to the design of drainage holes. I identified the problem, and was told nothing could be done. After suggesting they cover the drainage holes with screening, the broken glass was reduced significantly. Some candidates are upset that we hired extra staff to look after our seniors in a chronically understaffed facility. Prisoners have a bigger food budget than in seniors’ homes. I will be vigilant to ensure our seniors are experiencing the highest standard of care, and if not, we need to spend appropriate funds to comply. If standards are too low, I’ll lobby to raise them. These are the people who built our community. I’m a Certified Emergency Coordinator. Consequently, I have some insight into emergency management, and the important role the mayor fulfills. At this time, I favour an OPP costing – if only to acquire a benchmark for our own service. I’m sure this will result in savings as our own police service sharpens their pencils. We do not need a big-city police force with the latest toys. Provincial compliance has always been cited to justify escalating costs, but that can’t explain why so many police and firefighter salaries ended up on the Sunshine Club list. As I attack escalating management salaries, I do so with the utmost of respect and admiration for all our emergency workers from the front lines on up. This does not negate the need to identify savings and synergies. There are opportunities to eliminate duplication between police, fire, and ambulance. I intend to review our disaster warning and preparedness system. Our Emergency Plan is outdated. Let’s fix this ourselves minus the outside consultants. Many of my business ideas extend to and include farms. I grew up on a tree and shrub farm. The smell of rich Kent County soil is etched in my mind. Issue number one is that farmers cannot absorb any more tax increases. Period. MPAC already phased in punishing increases to assessment. There isn’t room for more. Our economic development plans must identify new agri-markets. It’s hard to find local produce in our local stores in Canada’s breadbasket, because corporate purchasing is done at the Ontario Food Depot in Toronto. I remember buying produce as a kid from tailgates in Market Square, and finding it in grocery stores. We can do better in opening markets. Bio-fuel research is emerging with promise. We used to have hemp production that American paranoia killed. Now that the latest electric cars are being made of hemp composites, perhaps that’s a new market to explore. Attracting the vegetable pre-processing sector has good potential. I will form a committee of educational experts to investigate the possibility of attracting a University Campus and expanded post-secondary programs in Chatham-Kent, including academic and medical curriculum. Working with the school board, I’d like to get local history on the curriculum. Chatham-Kent must ensure adequate retraining programs are set up and funded, including efforts to encourage the Grade 12 GED program. Too many unemployed workers were denied retraining because similar jobs existed elsewhere. Ontario Works makes it almost impossible to upgrade education. I’ll set a policy direction to improve literacy and high-school graduation rates. We can form partnerships with business and industry to implement and advance job-skill development. Many universities are offering free online courses (though not always for credit). This resource should be utilized more to improve learning. Our BIAs and Chambers of Commerce must be closer partners with the municipality in promoting and revitalizing downtowns across Chatham-Kent. These lines of communication need opening right to the mayor’s office. I think it’s time to explore improving traffic flow with sequenced traffic signals, striving towards central computerized control. Problem intersections must be addressed. I’ve followed a University of BC study that could assist us. Sidewalks are public infrastructure so I disagree with the policy that requires homeowners to pay the costs of installing sidewalks. Our airport is a neglected gem that needs to be better promoted as a destination and business attraction tool. I attended a fly-in recently with over 50 planes, so when special events are available, people will come. I’ll work towards providing more green space and trails. The lack of lakeside access along Lake Erie should be addressed, and include the Thames and Sydenham Rivers for preservation and park space. Investigate the lack of appropriate play areas across Chatham-Kent. Our beaches don’t figure prominently enough in promotional material, and there should be signage from the 401 to our beach areas. Absolutely no closures to rural libraries! We need to improve resources available, including more French language children’s books. Exploring partnerships with businesses may allow us to acquire a better inventory of books. I will continue to work towards protecting citizen’s consumer electronic equipment (wireless phones, baby monitors, cordless microphones and speakers, etc.) from the illegal interference caused by Hydro Smart Meters. I oppose sewer projects in areas where septic systems are the best environmental option (Bothwell). Improvements must be made to the method of apportioning water project costs. PUC policies which excessively penalize low income families will be reviewed. There is far more to my platform, and I’m happy to answer your questions. This is my vision for Chatham-Kent, and I’m ready to be elected mayor. A major issue facing families, seniors and businesses is the escalating cost of electricity. Smart meters were installed under the promise of saving us money, yet most customers will have substantial increases on top of the HST despite conservation efforts. In 2009, most salaries of Chatham-Kent’s Executive Management Team increased 7.3%. This comes in the middle of the worst recession since the ’30s, with local unemployment rating the highest in Canada. Since Randy Hope took office, the Sunshine Club expanded from 21 to 74 staff paid over $100,000 per year. In 2006, these salaries totaled “just” $2,419,639 – by 2009 they were $8,502,625! I propose implementing an immediate wage freeze of these Sunshine Club salaries until such time as Chatham-Kent experiences the growth and success necessary to sustain reasonable cost-of-living increases with no tax impact. This goes for my mayoral salary also. One hundred years ago, my Great-Grandfather Charles Austin was elected mayor of Chatham. My Grandmother wrote in her diary, “The election was such a nasty affair. You wouldn’t believe the terrible lies they told about dad.” I hope her comments won’t prove just as valid today for me. I have agonized over my decision to run for mayor. My papers were supposed to be filed much earlier, but my family and I were subjected to anonymous criminal extortion attempts that I think were meant to intimidate me against running. Apparently, some cowards don’t like what I might say, and they tried to stop me by harassing my family. This may be validation that the research and facts I presented on the Maple City Star are sustainable. Somebody wants me taken out of circulation and muzzled during the campaign. When you see “Austin Wright” on the ballot for mayor, that is who you will get if I am elected. I have no tolerance for the bait-and-switch we experienced last time, and I’m clear of third-party influences. My advisors will be council and you the public. I am not running for me – I am running for our future, our children’s future, and to give a voice to every person in this community. I am a businessman dedicated to achieving big results without using huge resources. No other municipality in Ontario has such an untapped potential for success! The only way this kind of activity can be combated is to expose it to light. My platform includes a comprehensive ethics component designed to peel back the opaque layers of secrecy and phony transparency at city hall. I will move to appoint an Integrity Commissioner, and implement a Lobbyist Registry so that nobody is able to short-circuit our elected council by whispering instructions in Administration’s ear or hide behind privacy laws to conceal their lobbying efforts. Chatham-Kent is in a financial crisis. Our unemployment rate is practically the highest in the country. We cannot afford to keep raising taxes and spending like a big city. Time and again we read how potential investors fell off the radar and located somewhere else. The last four years of mayor Hope ‘s business attraction efforts have been about as effective as shovelling incinerator smoke. We’ve had no meaningful success towards filling our vacant industrial land. I propose changing the concept of our 401 Industrial Park to a new design introducing green elements with which industry will want to be associated. When courting business, I will consider all available commercial and industrial opportunities in every community of Chatham-Kent, not just Chatham. Our website should be made more user-friendly, and I’ll make sure there is a portal for every community in Chatham-Kent. We will endeavour to solicit world-class content from our own residents, at no charge to taxpayers. Chatham-Kent will maintain a positive presence on emerging new media. Council agendas will be made more accessible online, and online services will better accommodate those with disabilities. We have spent too much on logos, professional studies and master plans that could have been developed much more economically by our own people. This is our community, but it’s being molded by distant consultants with no stake in the outcome. As mayor, I will oversee a migration towards less reliance on costly consultants, and start making better use of resources within the community by initiating citizens committees, think tanks, and brainstorming sessions. Our PUC must be kept public, and follow policies that are in the public interest instead of being driven by corporate marketability. I’ll establish criteria limiting expansion and amalgamation to initiatives firmly in the best interests of ratepayers. I will work to mitigate the financial impact of misguided time-of-use electricity billing policies that will negatively affect the cost of normal household routines despite conservation practices. Seniors and families should not be limited to cooking, washing, heating, cooling, and living during the night to avoid excessive hydro costs. My conduct as mayor will strive to restore a sense of community identity and civic pride that amalgamation didn’t seek to preserve. I favour initiatives that provide a degree of local autonomy, and allow some local benefit and reward for community accomplishments. I’ll support removing red tape for local endeavours such as outdoor ice rinks and celebrations. I will partner with local groups to inspire entertainment ideas that will encourage “city” people to visit our rural communities. I am not a politician. I’m a father and husband struggling to make ends meet like too many other people in this community. I’ve walked the walk, and have an acute understanding of the need for greater municipal fiscal accountability and economic opportunities. Over the coming weeks, my platform will outline additional ideas, and address the concerns I hear. People expect answers and foresight during a campaign, but they often get double-speak and publicity stunts instead. I will commit to listening, remaining accessible, and being responsive even after the ballots are counted.